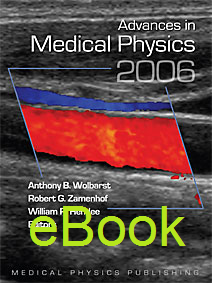 Advances in Medical Physics: 2006 is the first in a new, biennial series intended to help practicing medical physicists, technically inclined physicians, and other interested professionals to stay current in medical radiation science and technology—in particular, in subfields of medical physics other than their own. Experts in MRI, radiation oncology, or nuclear medicine physics will be able to keep track of what's new and exciting in ultrasound, flat-panel detector technology, and molecular imaging. Chapters are dedicated to the major modalities and important related areas, and they present discussions of current and prospective advances in the field. This initial volume in the series focuses on providing up-to-date scientific/technical background information. This text assumes the reader has a solid understanding at the level of the more challenging radiation physics textbooks for radiology residents: The text is ideal for the generalist in radiation science and technology, but less rigorous than what would be needed for a researcher in his or her own field. The series will be directed primarily at medical physicists and engineers, but should also be of interest to diagnostic and therapy physicians with strong technical backgrounds. It is also intended to support the instruction of medical, engineering, and medical physics students, as well as radiology and radiation therapy residents—in short, a volume and series that will offer information with significant value to the radiation medicine community. This series is being produced by three general editors and two medical editors. The general editors, Anthony B. Wolbarst (Georgetown Medical School), Robert G. Zamenhof (Tufts-New England Medical Center), and William R. Hendee (Medical College of Wisconsin) furnish overall direction for the project and will work to ensure a consistency of style and uniformity of technical level. Melvin Clouse (Harvard Medical School) and Anatoly Dritschilo (Georgetown Medical School) will offer guidance and manuscript quality assurance from the physician's perspective.